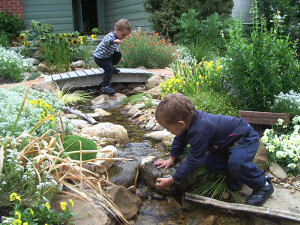 A garden stream, creek or waterfall is a great alternative to the traditional pond in your backyard. This has been made possible by a recent innovation called the pondless stream which is a stream or waterfall without a pond. Pondless water features provide the relaxing sound and beauty of running water over rocks, with no deep standing water, fish or water lilies. They are ideal when garden space is limited. Remember too that some areas of Melbourne limit pond depths for safety reasons, which can mean surrounding your beautiful natural water feature with an ugly pool fence. A shallow stream makes this unnecessary. While our natural garden ponds have reduced maintenance compared to traditional ponds, our pondless waterfalls have virtually no maintenance requirements. With no standing water and no fish, water quality isn’t critical. If you have deciduous trees, you may have to spend an hour or two clearing autumn leaves, and in summer you will need to top up the reservoir occasionally to account for evaporation. But that’s about it. 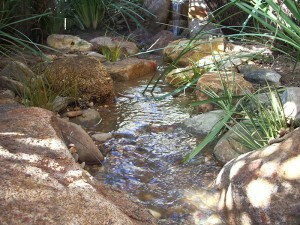 We can connect your pondless stream to your stormwater system, making sensible use of the rainfall on your roof to top up your reservoir. In large storms, overflow from the reservoir can feed into a dry creek bed or bog garden. At Ben Harris Gardens, we are passionate about designing and constructing stunning natural looking streams, creeks and waterfalls. This requires an artistic eye for detail and a talent for knowing how to work with natural elements. We make a rocky stream appear as if it was always part of the landscape and you just happened to build your house nearby. We do this by assessing the garden to ensure the stream or waterfall is located in the most natural position. We then take great care in the placement of rocks and plants to achieve a harmonious balance with nature. We can design a beautiful running stream or creek to suit many naturalistic styles of gardens such as cottage, native, woodland, tropical or Japanese. Additional details can be added such as bridges (in various styles), pebble beaches to entice visitors to get their feet wet, stepping stones, waterfalls, cascading falls and more. A collection of beautiful garden streams and waterfalls designed and constructed by Ben Harris Gardens. Sheet waterfall lit up at night. Cascading waterfalls running under a red, arched, Japanese timber bridge. Naturalistic stream with planting and rocks.